Combine eggs and milk in a bowl. Season with salt and pepper. Set aside. Melt butter in a medium-size frying pan on medium-high heat. Sauté the tomatoes and onions for 2-3 minutes. Add the eggs and cook completely, while stirring. Remove from heat. Cover tortillas in paper towels and heat them up in the microwave for 45 seconds to 1 minute. Take a tortilla and add 1/4 of the scrambled eggs. Sprinkle with cheese. Fold the sides and roll into a burrito. Place burrito inside parchment paper, fold the sides and roll like a burrito, once again. Repeat the process until you’ve used all the scrambled eggs. Place burritos inside a plastic bag and seal. Freeze for up to 1 month. To reheat, simply place burrito in the microwave and reheat for 1 to 2 minutes. Depending on your microwave you may to need more or less time. You can add your favorite vegetables to the scrambled eggs. For many families, mornings can be very hectic. Between getting the kids ready for school, making breakfast and getting ready for work, there’s almost no time left for breakfast and we always end up rushing. 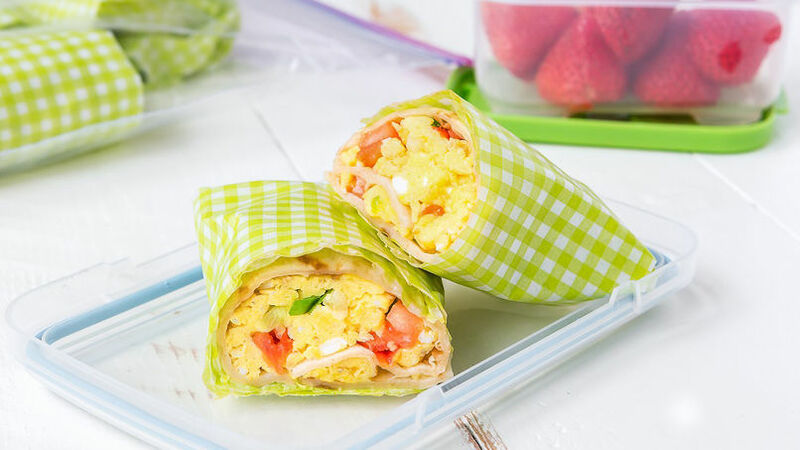 These frozen breakfast burritos are perfect for those mornings when we're running short on time. I make them during the weekend and that way I save time during the week. All that's left to do is reheat in the microwave, and done! Give them a try!